Capture Camera Clip is a handy photography tool that securely attaches your camera to any belt, strap or bag, then easily releases, so you can quickly capture the moment, instead of fumbling for equipment. Created by Peter Dering, an engineer with a passion for taking pictures, he believes wherever you go, whatever you do, your camera should be right by your side. His company Peak Design develops innovative product solutions for amateur and professional photographers. Weatherproof, ultra-light, and super durable, the minimalist Capture Camera Clip works with any camera and is strong enough to withstand over 200 lbs. of force. Designed to clasp snugly in multiple directions, it allows for fast lens changes, too. The built-in safety lock prevents accidental drops and theft, while a secondary plate rigidly stabilizes for video mode. Peak Design also makes a camera Leash, an adjustable strap that can be worn around your neck, slung on your hip and a Cuff that can be hung on your wrist. This camera gear means more great photos are just an instant away. My name is Peter Dering and I founded Peak Design in 2010. Our goal is to make it easier for anyone to take beautiful pictures by creating thoughtfully designed products that solve common photography problems. We are thrilled to share our story with The Grommet community, and we'd love to answer any questions you may have. Great idea! However, I did not appreciate the teaser email stating, "starting at $19.95", when that is the price for a wrist strap, not the pictured clip, which is actually $60. Felt a bit "bait & switch". Aaron from The Grommet here. We truly apologize for mis-setting your expectations. We try to be very considerate of the prices we show in the email, because, for example, sometimes accessories have a much lower price point than the main product (and in those cases, we show the price of the main items). For today's Launch, we feel strongly that the Leash, the Cuff and the Clips are all prominent features of the Peak Design story and likewise started with the lowest price in the email. Still, I entirely see your point and apologize again for your feeling misled. @Aaron I must admit... I felt exactly the same way Lynn did... the wording in the email says Camera Clip System starting at $19.95. I don't consider a wrist strap a "clip system," and thought this was misleading marketing. Wow! This looks really great. My husband and I go motorcycling and I like to take photos, but my SLR with telephoto lens is usually in the saddlebag and I'm using my point and shoot instead. And I'm not a fan of many of the ways to mount a GoPro and this looks much simpler. With our GoPro I find many of the mounting options awkward, they catch too much wind, or it takes up extra time dismounting them whenever we stop so that it's not stolen. I like the idea of a camera clip. I noticed you briefly showed a motorcyclist using one with an SLR in the video, but I'm curious of your experience with them in such situations. I'm not as worried about losing one on a hike, but crashing a couple thousand dollars worth of gear to the pavement at highway speeds has me nervous. Any words of wisdom? How susceptible are the clips to releasing by being bumped, and have you experienced any problems with wind buffeting while riding? Hey Sherry, Mark from the PD team here. Great question! Several of us on the team are avid motorcyclists. We, too, have a pronounced distaste for the idea of our cameras (and any part of ourselves) hitting the pavement at highway speeds. For that reason and many more, the Capture Clip was designed with a quick-release lock that can withstand over 200lbs of force. That ultimately means the clip is incredibly strong and secure, and the question of "will it hold my camera" can be answered with a resounding "yes," whether you're motorcycling, skiing, B.A.S.E. jumping, or walking around Disney Land. For folks who are a little skittish about the possibility of accidentally pressing the quick-release button, Capture has a built-in safety lock. Just twist the quick-release button a quarter turn and your camera will be completely and utterly locked in, even if you accidentally hit the button. The question you bring up about wind resistance is an interesting one. The answer depends on how fast you're riding, how big your camera is, what sort of bike/fairings you have, and what kind of backpack you're clipping your camera onto. The short answer is that none of us have ever experienced noticeable wind resistance with our cameras, which range from DSLR to compacts. We've mounted them both on the belt and backpack strap. Our bikes do not have windscreens or fairings, so even with our bodies exposed we've been fine. In your case, if you have a DSLR and, say, a 70-200, you'll probably want to mount it on your backpack shoulder strap. You'll want to make sure the backpack itself is tight-fitting. 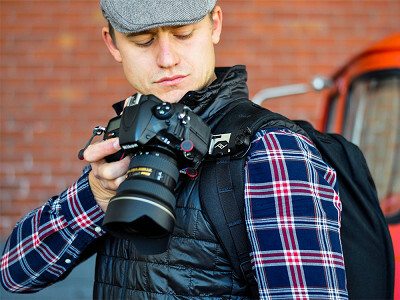 If the backpack has an additional sternum strap, you can wrap that around the barrel of the lens for a completely secure connection. Hope that helps! Thanks for checking us out! 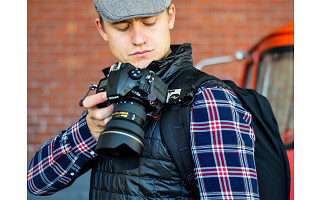 Wow...innovative and practical alternative to the awkward camera strap. The fact that it's made in China is a tremendous turnoff, however. Please consider manufacturing your products in another location (um....how about the US?). Until then, the camera strap stays. @Barbara Adam from the PD team here. Where companies decide to manufacture their products has always been an important issue for consumers and businesses alike. As you noticed, we do make our stuff in China. We respect your viewpoint here, and furthermore we think it's important for businesses and consumers to have an open dialogue about where their products are made and why. In 4 years of doing business we've learned quite a bit about manufacturing - both abroad and in the US. We've evaluated many options. And, we've learned surprising things about what "Made in the USA" actually means when you see it on a product. Have a read and let us know what you think. It may not change your mind, but it will at least give you insight into how we make decisions about our products and manufacturing. Capture Camera Clip is a handy photography tool that securely attaches your camera to any belt, strap or bag, then easily releases, so you can quickly capture the moment, instead of fumbling for equipment. Created by Peter Dering, an engineer with a passion for taking pictures, he believes wherever you go, whatever you do, your camera should be right by your side. His company Peak Design develops innovative product solutions for amateur and professional photographers. Weatherproof, ultra-light, and super durable, the minimalist Capture Camera Clip works with any camera and is strong enough to withstand over 200 lbs. of force. Designed to clasp snugly in multiple directions, it allows for fast lens changes, too. The built-in safety lock prevents accidental drops and theft, while a secondary plate rigidly stabilizes for video mode. Peak Design also makes a camera Leash, an adjustable strap that can be worn around your neck, slung on your hip and a Cuff that can be hung on your wrist.